Principal Cast : Vin Diesel, Michelle Yeoh, Mark Strong, Mélanie Thierry, Lambert Wilson, Gerard Depardieu, Charlotte Rampling. Synopsis: A mercenary must take a young girl and her protector through corrupt and war-torn Russia to New York, where an evil religious cult has plans to use her in their quest to control the world. At least, I think that’s what this mess is about. 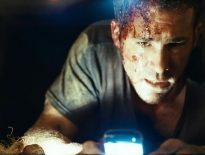 What we think : Dull, plodding, and convoluted, this sci-fi opus from director Matthieu Kassovitz offers neither thrills or valid human emotion. It’s an empty, unlikable affair, although whether this is attributable to Kassovitz or the purported interference from 20th Century Fox is hard to fathom – perhaps the central premise didn’t appeal to me, or connect with me, but in the end, I could help but be disappointed. One-time mercenary Toorup (Vin Diesel) accepts a contract for a people-smuggling operation from a Russian mobster: he must transport a young woman named Aurora (Mélanie Thierry, last seen by Aussie audiences in The Legend Of 1900) and guardian Sister Rebeka (Michelle Yeoh) from their convent in Mongolia to New York, through a world beset by violence and corruption. In doing so, he must protect the young woman from outside forces who see her as a valuable commodity, and eventually as some kind of savior of humanity. A group of religious fanatics known as the Neolites have unleashed a plan to bring about some kind of new world order, and Aurora is the key to it all – Toorup finds himself in a battle to keep Aurora alive. This all takes place “in the near future”, an almost apocalyptic Beyond Thunderdome clone with a society on the brink of collapse. French director Kassovitz, like many of his countrymen directing with Hollywood money, stumbles with the story even though the visual aspect is sublime – his vision of the depravity of a descending human race is both dark and nuanced, and his camerawork is excellent (and typically French – I swear, I have a glimpse of Luc Besson in my minds eye when I watch this…). The story is based upon the novel by Maurice Dantec, and transposed to this format by Matthieu Kassovitz and fellow screenwriter Eric Besnard, and while there have been significant changes to the characters and the locations, I suspect the changes were such that much of the quality of Dantec’s original vision were lost. Babylon AD is a muddled, confusingly obscure Hollywood film, with Vin Diesel looking totally out of place amongst his fellow cast members, all of whom do a much better job in their respective roles that he does in his: I’m not sure whether his role was written well enough for him, or whether he was just having an “off day”, but Diesel looks like he’s utterly confused by it all. Michelle Yeoh also looks like she’s wondering what on Earth she’s done by signing up for this one, and even her action scenes seems hurried and rushed, lacking style or energy. Mark Strong has a glorified cameo as a friend of Toorup, while Lambert Wilson serves to elevate the film a little in the end. Mélanie Thierry, as the wide-eyed Aurora, is suitably organic as Babylon AD’s MacGuffin, although I found her dialogue lacked ambition in its depth and credibility. Thierry delivers her half-cooked religiously ambiguous material with conviction, even though she’s working uphill to convince the audience she’s as fragile/powerful as we’re suspecting. The script seems content to mix pseudo-religious and mystical symbolism with a violently brutal action aesthetic, something that doesn’t quite work as it should here – Kassovitz seems ill-prepared to produce the action heartbeat this film could have delivered, and as a result, the film limps into its finale with a barely discernible pulse. The film looks stylish, for sure, but that’s as good as it gets. The rest of it is all largely forgettable. Was ‘Babylon A.D.’ Really That Bad?